It is a physically plausible Bxdf that is fully energy preserving. Two diffuse model choices: Zinke and Kajiya. Fully implemented Marschner specular lobes: multiple specular transport paths (R, TT, and TRT paths based on the hair scattering model of Marschner et al. ); glints; eccentricity for elliptical cross-sections with azimuthal roughness control. The implementation of the Marschner is using a ''data-driven'' light scattering model with Adaptive Importance Sampling that is optimized for hair rendering quality and most importantly hair rendering speed. See Pixar Technical Memo 15-02 "A Data-Driven Light Scattering Model for Hair" by Leonid Pekelis, Christophe Hery, Ryusuke Villemin, Junyi Ling for more information. Multiplier on diffuseColor. The product of diffuseGain and diffuseColor should be high (up to 1.0) for woolly fur, and low for e.g. human hair. To use the base and tip color from Maya Fur, create a PxrPrimvar node and set the Variable Name to Cs and Variable Type to color. Then wire its resultRGB to the Diffuse Color. We can also connect the color result from any RIS pattern into the Diffuse Color. For root and tip color along the length of the hair, we create a PxrPrimvar and set the Variable Name to v and then connect its output into a PxrMix node's Mix to mix between the root and tip color. Primary Specular: R is for "reflect" where light hits the surface of the hair and reflects. This is the strong primary non-colored specular. Secondary Specular: TRT is for "transmit", "reflect", and "transmit" where light transmits through the hair surface, then it reflects from within the hair surface and transmits to the front of the hair surface. This is the secondary colored specular. Transmit Specular: TT is for "transmit" and "transmit" where light transmits through the hair surface and then transmits out of the back of the hair surface. This is the colored transmission that responses to back lighting. See Marschner et al. for more information. Specular color for tinting the Transmit Specular (the TT lobe), Secondary Specular (the TRT lobe) and GLINTS lobe. This specular color does not tint the Primary Specular (the R lobe) which is controlled separately by the Primary Specular Color. Note that because the TRT lobe goes through the fiber volume twice, it is tinted by the square of the specular color. Gain for the R lobe of Marschner specular. This is like a clearcoat where the specular is fairly sharp and glossy and normally not colored. This specular is a direct reflection which is not tinted by any volume attenuation. Specular color for tinting the Primary Specular (the R lobe). 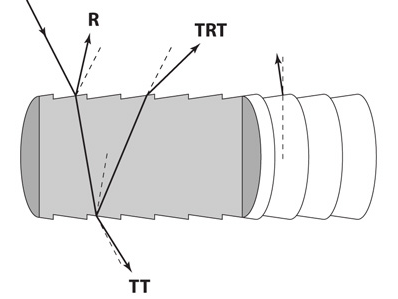 Gain for the TRT lobe of Marschner specular. This is a rougher and colored specular. This goes through the fiber volume twice. Gain for the TT lobe of Marschner specular. This is a transmission-type (refraction) specular with some volume attenuation. It goes through the fiber volume once. Cone angle (theta) in degrees. The broader the angle, the softer and broader the highlight. How much do we account for fresnel attenuation. Smooths TRT distribution, should be between 10 and 25. Elliptical cross section aspect ratio. Between 1 and 0.85. Note that eccentricity depends on Nn. Note that Nn from the hair geometry should be in correct orientation. Hair mask. This sets the presence (whether the hair is visible). Note that Presence in RIS means the chance of surface hit. It should be either 0 or 1. By default, it is set to 1 meaning that it has 100% chance of surface hit and thus the surface is present to the renderer. If it is set to 0, that means the surface is not present to the renderer. Setting it between 0 and 1 may produce unwanted noise. Shadow opacity color currently only works in the PxrPathTracer integrator and not VCM. Connect an AOV pattern like PxrMatteID to trigger AOV output. Maya Fur/Hair uses Kajiya-Kay specular model which is different than Marschner's specular model. Marschner's specular model is closer to real hair's specular response. There are no exact mappings from Kajiya-Kay specular shader parameters. First adjust the specular cone angle in PxrMarschnerHair. It should be between 5 to 10 degree. The broader the cone angle, the softer and broader the hair which is the opposite of the response from specular power and specular sharpness, where the larger number yields a sharper and smaller hightlight.